Concept art for the proposed My Thuy seaport. Photo courtesy of MTIP. 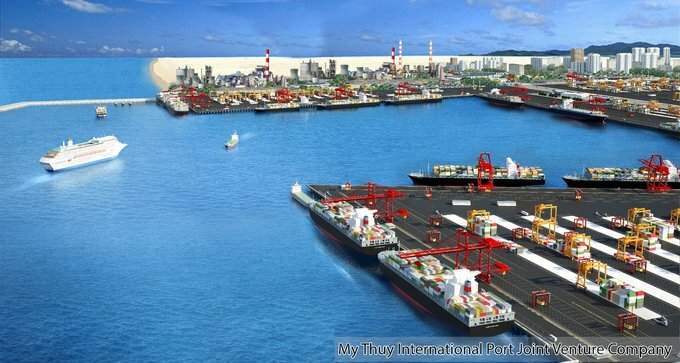 The My Thuy International Seaport will be built at an estimated VND14 trillion ($601.92 million) in central province of Quang Tri. The 685-ha port will have a draft of 17.5 meters, 10 berths and be able to accommodate vessels of 100,000 deadweight tons. It is expected that next June ground will be broken for the facility in the Quang Tri Province Southeast Economic Zone. According to the province people’s committee, the port will become an entrepot, enhancing Quang Tri’s import and export capability. Vietnam has 44 seaports with a total capacity of 470-500 million tons of cargo a year, of which 10 are large facilities. Statistics from the Vietnam Maritime Administration show that the volume of cargo passing through the ports in the first 11 months of last year was 478 million tons, 19 percent up year-on-year.